'Lynyrd Skynyrd', one of the most commercially successful and critically acclaimed Southern Rock groups of the 1970's, was founded in the mid-1960s when five friends - singer Ronnie Van Zant, guitarist Gary Rossington, guitarist Allen Collins, bassist Leon Wilkeson, and drummer Bob Burns - formed at Robert E. Lee High School in Jacksonville, Florida, initially as the group, 'My Backyard.' By 1969, the band's name had changed to 'Lynard Skynard' to immortalize (and jab at) their school gym teacher and coach Leonard Skinner, who was regarded by the long haired students as a source of teen angst. In 1972, the band was discovered by producer Al Kooper of “Blood, Sweat, and Tears,” who had attended one of their shows at a club in Atlanta. The band changed the spelling of their name to "Lynyrd Skynyrd", and Kooper signed them to MCA Records, producing their first album, which was self-titled, in 1973, and featured their hit song "Free Bird", which received national airplay, eventually reaching #19 on the Billboard Hot 100 charts. 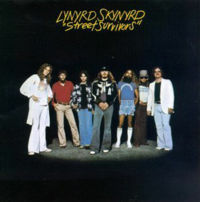 The band enjoyed rising success, and Lynyrd Skynyrd was set to headline at some of the top venues in the nation, including Madison Square Garden -- fulfilling a lifelong dream of Van Zant's – on their “Street Survivor” tour of 1977, which started in Miami, Florida, on October 15th, 1977, and was set to end on February 1st, 1978, in Honolulu. The music group stood on the precipice of becoming one of America's favorite touring bands, coupled with the release of their sixth album, named Street Survivors, on October 17th, 1977, & sold a half million records immediately upon release. 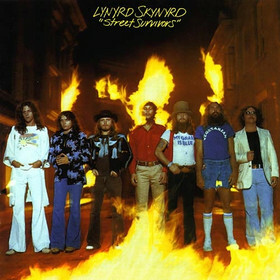 Of note, the cover of the album featured a photograph of the band, engulfed in flames. The album also included an order form for a "Lynyrd Skynyrd Survival Kit". As an integral part of the tour, a airplane was required to transport the band, their management, entourage, and roadies, from gig to gig. 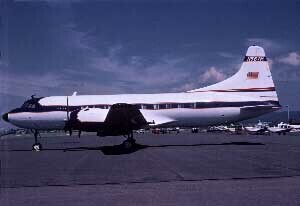 The aircraft chosen, a Convair 240, was manufactured in 1948, the third one ever built, and originally delivered to Western Airlines on December 30, 1948 and registered NC8401H. The aircraft had gone through many owners before being purchased by the L&J Company of Addison, Texas, in April 1977, been registered as N55VM, and had accumulated over 29,000 flight hours in October of 1977. The plane was powered by two counter-rotating Pratt & Whitney R-2800 engines. Ironically, the same plane had been inspected by members of Aerosmith's flight crew for possible use in the early summer of 1977, but was rejected because it was felt that neither the plane nor the crew were up to standards. In an interview in the book “Walk This Way”, Aerosmith's assistant chief of flight operations Zunk Buker tells of seeing the pilots, Captain Walter W. McCreary and First Officer William J. Gray, Jr., employees of Falcon Aviation, trading a bottle of “Jack Daniels” back and forth while Buker and his father were inspecting the plane. Ronnie Van Zant's last words before he boarded that plane were, "If it's your time to go, it's your time to go." The Convair departed the Greenville Downtown Airport (GMU) a little after 4 PM, Eastern time, on October 20th, 1977, and bound for Ryan Airport (BTR) in Baton Rogue. Aboard were the two pilots, and 24 passengers, all associated with Lynyrd Skynyrd in one way or another. The intended route of flight for N55VM was to be, via Instrument Flight Rules, following radio navigation airway V-20 to Electric City, direct Atlanta, direct La Grango, direct Hattiesburg, V-222 to McComb, then V-194 direct to Baton Rouge. The pilot requested an altitude of 12,000 feet and stated that his time enroute would be 2 hours and 43 minutes, and that the aircraft had 5 hours of fuel on board. But, at around 6:42 PM, one of the pilots advised the air traffic controllers, based at Houston Center, "Yes sir, we need to get to an airport, the closest airport you've got, sir!" Houston Center responded by asking the crew if they were in an emergency status. The reply was, "Yes sir, we're low on fuel and we're just about out of it, we want vectors to McComb, post haste please, sir!" Houston Center gave the flight vectors to McComb and advised it to turn to a heading of 250 degrees. The flight did not confirm that a turn was initiated until a few moments later, but then the pilot of N55VM said, "We are not declaring an emergency, but we do need to get close to McComb as straight and good as we can get, sir!" A minute later, the crew of N55VM advised Houston Center saying, “55 Victor Mike, we're out of fuel!" Center replied, "Roger, understand you're out of fuel?" The flight replied, "I'm sorry, it's just an indication of it." The crew did not explain what that indication was. Then, Houston Center requested the flight's altitude. The response from the flight crew was, “We're at four point five." That was the last recorded communication between N55VM and Houston Center. 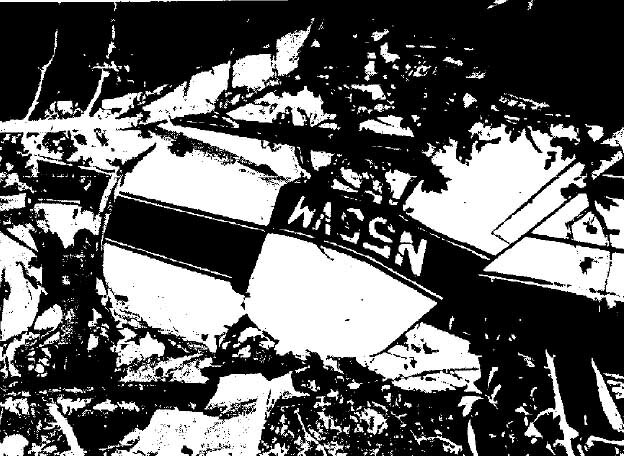 A few minutes later, the sound of an emergency location transmitter was heard by a nearby aircraft, broadcasting from a remote wooded section near Gillsburg, Mississippi. 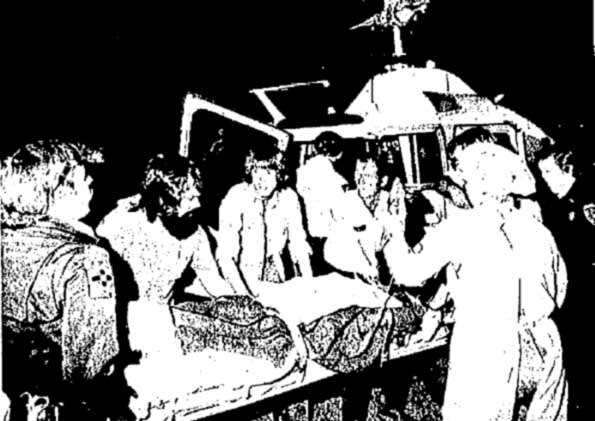 The plane had skipped and skidded across tree tops for about 100 yards, then smashed into a swampy area, twisting the cockpit to the left, throwing several people to the ground when it split open at about the middle of the fuselage, and spilling the plane's contents throughout the mangrove, on timber company acreage adjoining the farm of Johnny Mote. Johnny Mote, a 22-year-old dairy farmer & factory worker, who lived near the crash site close to the Mississippi-Louisiana border, told reporters that the plane "sounded like a car skidding in gravel" as it clipped the trees. "When it hit the ground it was a deep rumble, like it was underground. It sounded like wrinkling metal" he said. Mote recalled that he was putting some hay out when three bloody survivors, who had made their way through the woods, called him for help. "One of them was hugging me around the neck and telling me, "We got to get them out." One of the first rescue workers on the scene was Jeffrey Wall, 23, and a member of the Gillsburg Volunteer Fire Department. He said that when he reached the crash site, he learned that three members of the band had scrambled out of the plane and gone to Mote's house about a quarter mile away for help. "They were in pretty bad shape. One of them had some ribs sticking out and the other two had blood all over them," Wall said. "Some people were crying and some were moaning. Some didn't know what was going on," Wall said. He also said rescuers had to wade through a waterhole to get to the crash site and that, once there, they had to remove band instruments to free trapped survivors. The thick undergrowth of the swamp hampered rescue operations, and several emergency vehicles became stuck in the mud when they tried to drive through the woods to get close to the aircraft. Rescue crews were also hindered by a 20-foot wide, waist deep creek they had to cross to reach the plane. Three helicopters from the Coast Guard, National Guard and Forrest County General Hospital assisted in the rescue operation, transporting medical personnel to the scene, and lighting the crash site with floodlights, and two bulldozers were used to cut a rough road through the woods and brush from the nearby Mississippi State Highway 568. Nearly everyone aboard was injured and taken to one of the nearby hospitals, where identification of the victims were complicated by the fact that several of the passengers were apparently playing poker before the plane crashed, and had their wallets, with their identification papers, out. 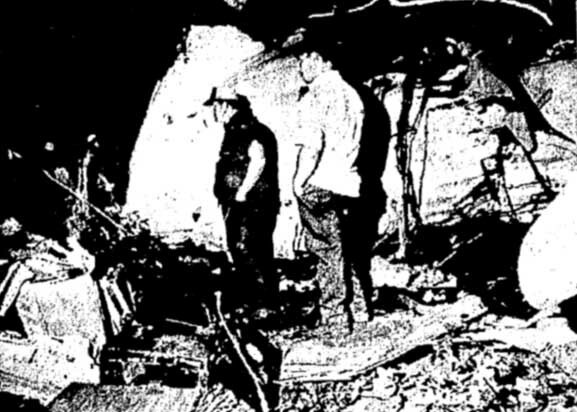 However, when the smoke cleared, six lives were claimed in the crash including singer/songwriter Ronnie Van Zant, guitarist/vocalist Steve Gaines, vocalist Cassie Gaines, assistant road manager Dean Kilpatrick, pilot Walter McCreary and co-pilot William Gray. Steve and Cassie Gaines were buried October 23rd in Miami, Oklahoma, their hometown. Private services were held for Ronnie Van Zant October 25th in the Jacksonville Memory Garden. Billy Powell, on crutches and with his face stitched up, was the only band member able to attend. Friends attending included Dickey Betts, Charlie Daniels, Al Kooper, Tom Dowd and members of Grinderswitch, .38 Special and the Atlanta Rhythm Section. Two weeks after the crash, in the November 5th, 1977, issue of Billboard Magazine, a two-page ad appeared. With a black background, and white script writing, it read "Thank You, GOD, for Sparing Ronnie's Band. There Isn't A Song That Can Express Our Feelings For Ronnie, Steve, Cassie & Dean. Atlanta Rhythm Section, Studio One, Doraville, GA" The second page listed the names of the three deceased players and their manager. MCA Records, out of courtesy, withdrew the "Street Survivors" album cover and replaced it with another design, this time a photo of the band striking a similar pose against a plain black background. The album rose the sales charts to become the band's second platinum selling album, hitting #5 in the United States. Investigators discovered that the right engine's magneto - the aerospace equivalent to a spark plug - had been malfunctioning, then making possible that the damaged magneto fooled the pilots into creating an abnormally rich fuel mixture, causing the Convair to literally run out of fuel. The National Transportation Safety Board determined the likely cause of the crash of N55VM was, "fuel exhaustion and total loss of power on both engines due to crew inattention to the fuel supply." The Safety Board further found that the fuel exhaustion was caused by deficient flight planning, and an engine malfunction of undetermined nature in the right engine which resulted in higher than normal fuel consumption. In 1987, Lynyrd Skynyrd reunited for a full-scale tour with crash survivors Gary Rossington, Billy Powell, Leon Wilkeson and Artimus Pyle and former guitarist Ed King. Ronnie Van Zant's younger brother, Johnny, took over as the new lead singer and primary songwriter. However, in interviews decades after the crash, Artimus Pyle that the pilots, panicking when the right engine failed, accidentally dumped the remaining fuel. Of course, in another interview with Howard Stern, Pyle stated that the fuel gauge in the plane malfunctioned, and the pilots had failed to manually check the tanks before taking off. On March 16th, 2006, members of Lynyrd Skynyrd were inducted into the Rock and Roll Hall of Fame in Cleveland, Ohio, including singer Ronnie Van Zant, guitarists Gary Rossington, Allen Collins, Ed King, and Steve Gaines, bassist Leon Wilkeson, keyboard player Billy Powell, and drummers Bob Burns and Artimus Pyle. Of course, the crash is remembered by another generation by a famous line in 1997 movie Con Air when, after the prisoners successfully escaped, the song "Sweet Home Alabama" played in background as the convicts partied. One of the characters, Garland Greene, played by Steve Buscemi, said, "Define irony: a bunch of idiots dancing around on a plane to a song made famous by a band that died in a plane crash."